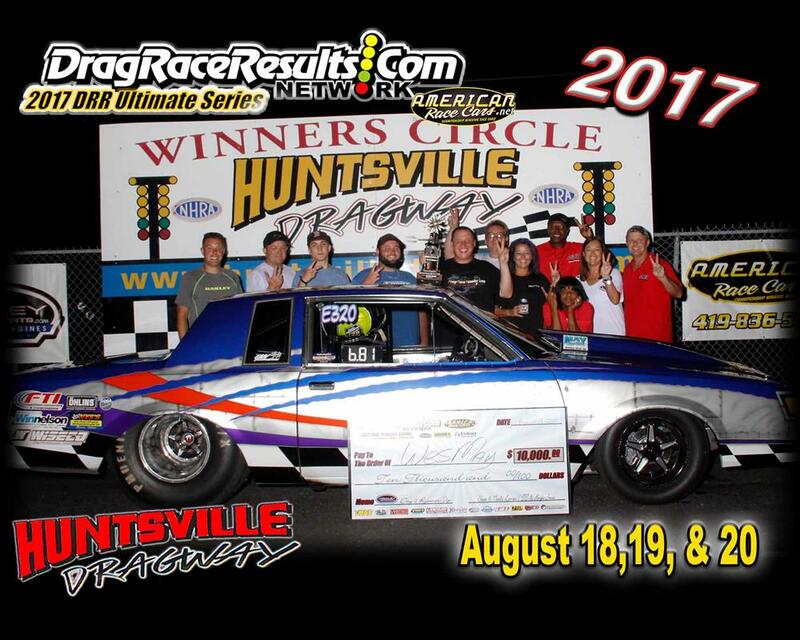 Racers returned to Huntsville Dragway this past weekend for the (Tropical Storm Wash Out) re-scheduled Event #2 from this past June. With ZERO rain drops and only one oil down over the 4 days of racing, 200 of the Nation's best bracket racers battled it out for Big Money, Big Checks, Awesome Trophies and the "Coveted" JEGS Points Fund. Mike Bloomfield Jr backed up his 2016 Summer Oakley Motorsports $50,000 Win this past weekend to show why he has become one of the best bracket racers in the country. Super Gas World Champion and previous DRR Ultimate Series winner Bryan Robinson cashed in on Friday's BRODIX $20k and Wade White took home the hardware and the other $20,000 from Yukon Gear & Axle on Sunday. 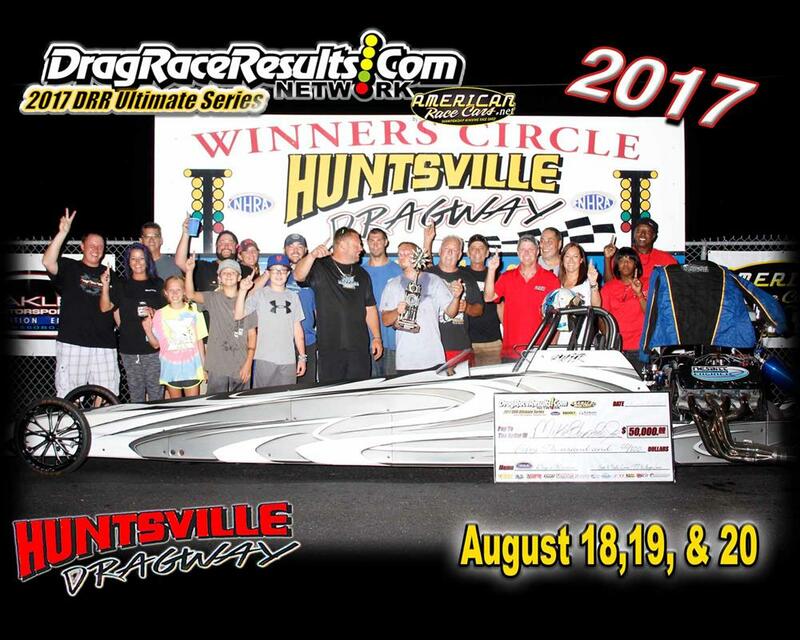 Thursday kicked off the racing action at Huntsville Dragway with the Champ's Performance FTI Warm-Up Race. 90 Racers took advantage of the $100 Test-N-Tune / Warm-Up Race where the Winner received $2,500 and an FTI Torque Converter of choice from Champ's. The Runner Up received $1,000 Cash with the Semi Finalist receiving $500 Cash. Josh Luedke from Evansville, IN. 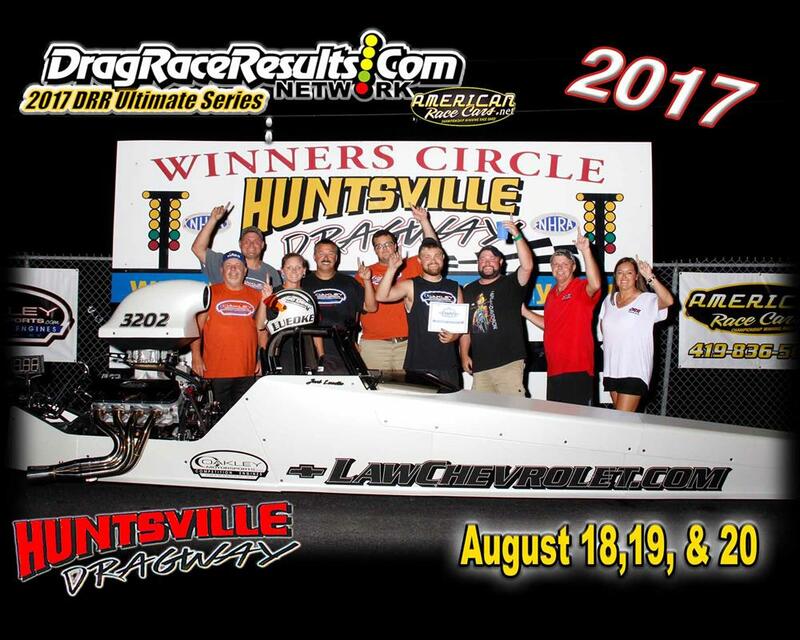 in his Law Chevrolet backed dragster defeated Daniel Wiles from Madison, TN in the finals. Eva Lane out of Hixon, TN was the lone semi finalist. 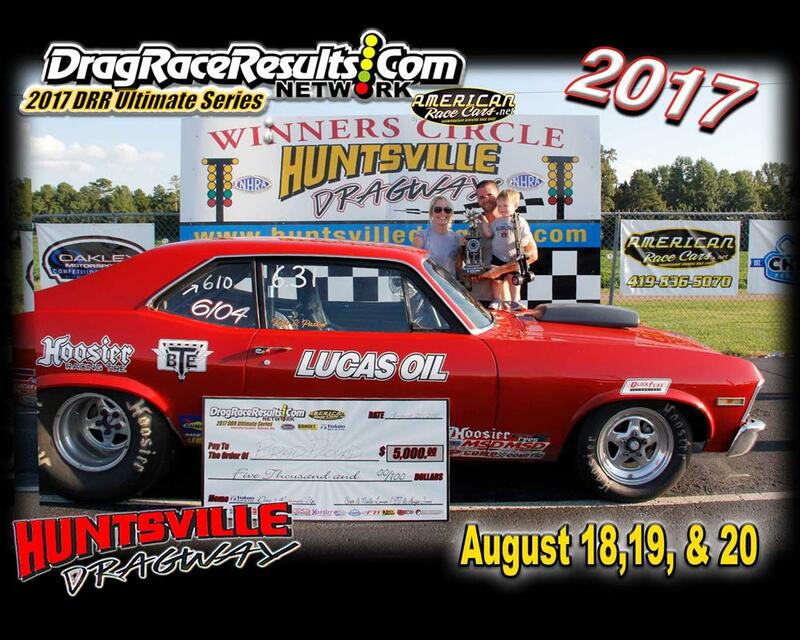 Friday brought clear blue skies, $20,000 from BRODIX and great racing action at Huntsville Dragway. When the field finally was sorted out down to 3, former Super Gas World Champion and BTE representative Bryan Robinson, traveling "young gun" Nick Smith from Oklahoma and APD Carb builder and BEAR Racing driver Randy Scheuer Jr. were left to battle it out for the Big Bucks and Hardware. Robinson and Scheuer Jr faced off in the semi-finals with a less than .001 margin at the finish line, Robinson's .008 dead on 3 slightly edged out Scheuer's .005 dead on 6 for the victory and the set meeting with Nick Smith who received the single in the semi's. In the final, Robinson took control of the race from start to finish with a .007 lamp dead on 9 to seal the deal for $20,000 and his 2nd DRR Ultimate Series win in 2 years. 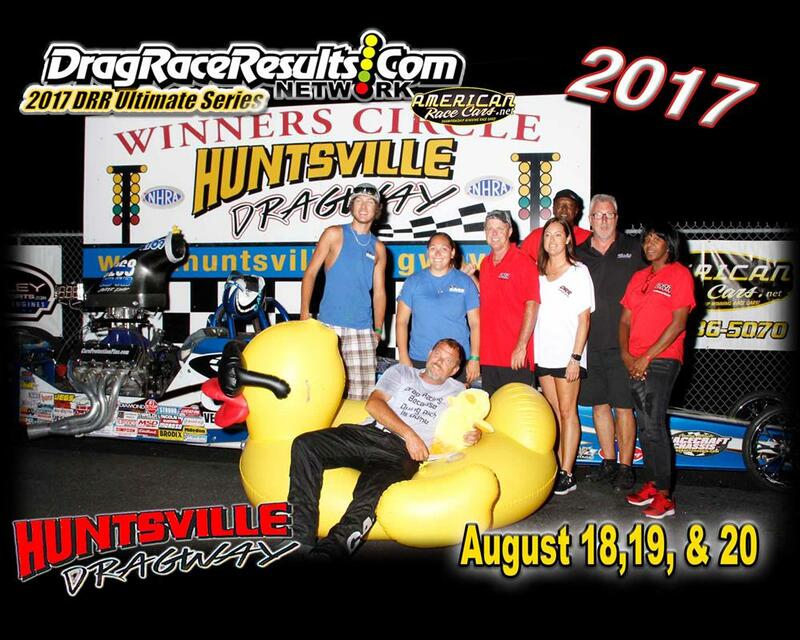 What has become an anticipated great time for racers who have had a tough day, the "FREE" Duck races consist of 16 random drawn racers who lost 1st round and then did not win in the re-entry round either. At no charge to the racers, the 16 race off to the victory where the winner receives a APD Carburetor on Friday' Nights and Hoosier Slicks on Saturday Night with the runner up receiving $250 cash and the semi-finalists receiving $150. Friday's APD Duck race saw Chad Axford defeated Jason McKague with the semi finalists Jamie Tupper & Ryan Richardson. Friday's "FREE" Yukon Gear & Axle which is provided at no charge to all racers in competition on Friday and Saturday is a final time run for all racers where the racer closest to the dial receives a FREE complete center section from Yukon Gear and Axle. 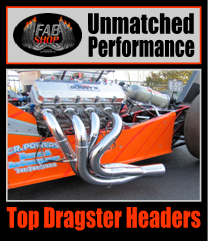 Friday's winner was Heath Davis from Cullman, Alabama with a dead on .0004. Saturday brought back a 2nd day of outstanding racing by some of the Nation's best Big Money Bracket Racers. Round 3 saw 33 pairs of cars go down the track with over half the field showcasing .00x reaction times. $50,000 presented by Oakley Motorsports Competition Engines to win will do that. With 5 cars remaining Saturday evening, the bye went to Tennessee's new resident Chad Axford who has been on a hot streak of lately with his .000 lamp. Wes May and Roy St. Dennis faced off along with Mike Bloomfield Jr and Aaron Vail with May and Bloomfield Jr getting the wins. At 3 cars Bloomfield and Axford faced off to see who would take on Wes May for $50,000 and Saturday Night's bragging rights. Bloomfield played unfair and didn't event let Axford in the race as he laid down a .000 dead on 1 lap to end Axford's night and to seal a deal to the final round. Final Round Bound, Bloomfield and May both decorated racers faced off for $50,000 and awesome Cold Hard Art trophies. With his .000 tree "little" Mike received lane choice and put May out of his lane. The move paid off and Bloomfield controlled the race from start to finish, repeating as the DRR Series summer event champion for 2 years in a row. Saturday's Hoosier Duck race saw Jason Lynch defeated Rick Huffman. Saturday's "FREE" Yukon Gear & Axle which is provided at no charge to all racers in competition on Friday and Saturday is a final time run for all racers where the racer closest to the dial receives a FREE complete center section from Yukon Gear and Axle. 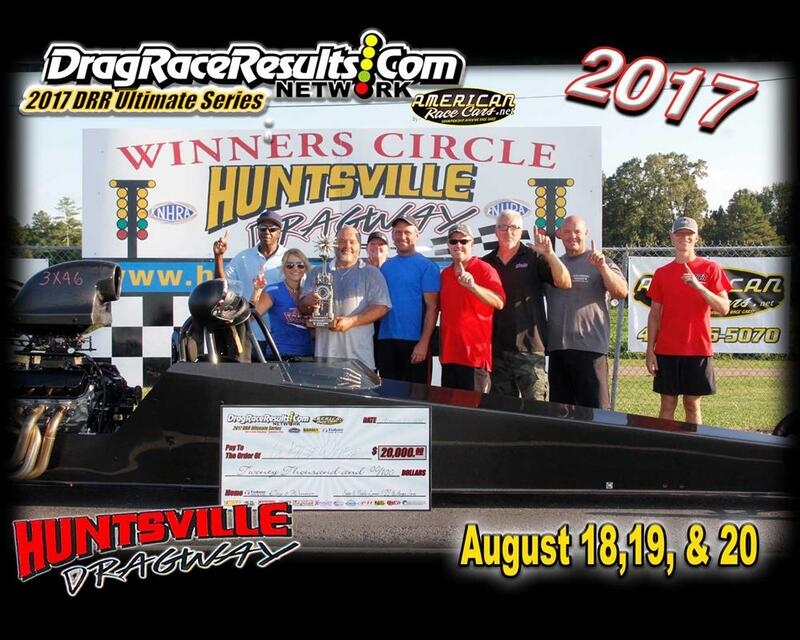 Saturday's winner was Johnny Ezell from Ventress, Mississippi with a dead on .0006. For the 3rd day in a row, sunny skies returned to Huntsville along with another amazing day of racing action for the Yukon Gear and Axle $20,000 to win race. While Wade White was rolling through the field in his new Danny Nelson Racecraft built dragster, Brad Plourd and Kasey Tankersly we taking down the door car side. White received the bye in the semi's and Plourd took care of Tankersly with a .009 initiated run. Plourd's Nova had been stuck on a 6.31 dial for 6 plus runs but it was Wade White who brought the gun to the fight where he posted a .000 light to start the race and that was all it took to wrap up the race, day and event along with a $20,000 Big Check. K&R Performance's Kevin and Betty Rodden post $250 Cash Bounty Award in 2017 for the racer who defeats the previous day's winner at each event. Saturday Madison Gates defeated Friday's Champion Bryan Robinson and on Sunday Wade White defeated Saturday's Champion Mike Bloomfield Jr. Both received $250 Cash courtesy of K&R Performance. The weekend's event was started by a celebration of life and a 34 second moment of silence for 2 of our close friends who lost their lives in the recent month. Thomas Dunford and Wendell Webster Jr both succumbed to injuries from racing accidents. Our hearts go out to their families. May Thomas and Wendell rest in piece. Christopher Martin debuted his beautiful new Super Pro Monza this past weekend. The hidden jewel in this baby is the thumping stereo system that comes with it. Christopher got to show it off during a short oil down late Saturday while sitting in the water box. Job well done Martin family. Due to the date this past weekend's event was re-scheduled to, MotorManiaTV was not able to broadcast the event. Quick Performance will once again be bringing Live Coverage to the Championship Event September 22nd - 24th! Points are currently being updated but not completed. They should be very close by Friday August 25th. Thank you ~ See Ya'll in Huntsville!